When it looks like this outside I start getting in the mood to “nest.” It’s amazing to me how different that look is each year! This is my living room as of today – October 13, 2010. It took me a long time to get it to the place that I could say I’m satisfied with the way it looks, but I think I’m there now. 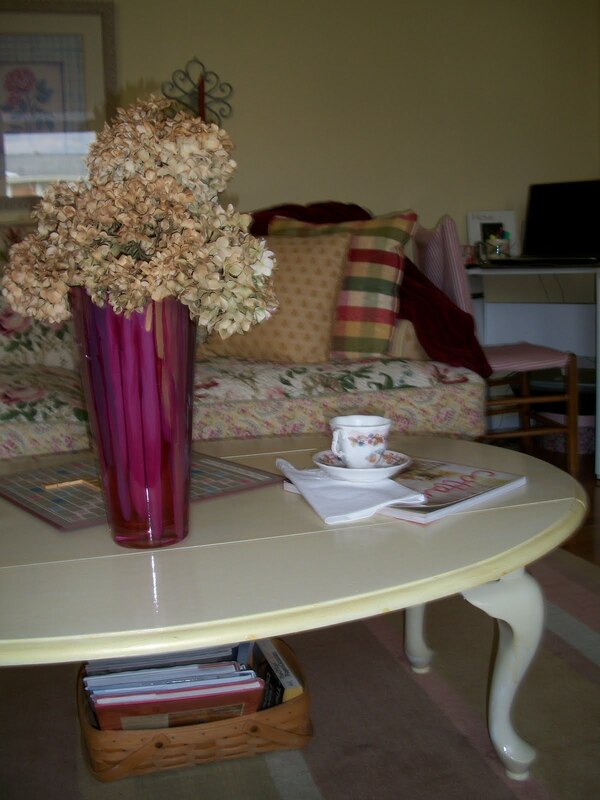 It’s the style I like – kind of Shabby Chic/French Country, or my version of it anyway! I’ll take you into the room and show a few parts of my fall nesting. This is the shelf in my entryway. I try to make the decorations on here seasonal and yet keep it in the functioning design I learned about last spring. I have a couple means of lighting – the lamp and the small tin light on the second shelf. The tin light also serves as a fragrance for the room with the potpourri rocks inside. I have Hershey’s miniature candy bars for my guests in the little dish on the top shelf, and a jeweled pumpkin resting on the candle stick. I love this little tin-punched Trick or Treat sign. I found it at the sidewalk sale at Cracker Barrel this summer for $2! Adding layers to a room give it a cozy feeling. Rugs, quilts, throws, and baskets are all part of the layering. I placed a basket under the coffee table with Fall magazines (and the Scrabble dictionary for those serious players!). I also pulled out my velour throw and placed it across the arm of the couch. A In the kitchen, a small child’s chalkboard with a few wooden fall accents and a bow were added for decoration. It is used for a Scripture verse, the daily menu, whatever strikes my fancy. The fall wreath on my front door got an accent of the metal “C” I found for a steal at TJ Maxx. I do not claim to be a decorator – I’m just a nester! What do you do to “nest” in the fall and winter? Thank you, Betty; you have encouraged my heart!